The photoelectrocatlytic system is a discharge photocatalytic system aimed at enhancing the photocatalytic performance. In this study, we have obtained experimental data revealing the basic mechanism of the photoelectrocatalytic system. We also report removal of xylene isomers in air using the photoelectrocatalytic system, and these data are compared with our previous data on benzene and toluene. Our analysis based on the Lagmuir-Hinshelwood(L-H) kinetic model shows that the rates of degradation are in the order; benzene < toluene < xylene, in the photoelectrocatalytic system, and explanations are given for the trend. TiO2 photocatalysts show wide range of photocatalytic activities including decomposition of aliphatic and aromatic compounds and killing of bacteria both in air and aqueous environment under ambient condition[1-3]. In addition to high photocatalytic activities of wide range, photochemical stability and low cost for manufacture have given TiO2 photocatalysis good prospects for clean technology against environmental pollutions[4-5]. However, wide spread commercial use of TiO2 photocatalysts has been slow, mainly due to the large band gap energy(3.2eV) and rapid recombination of photogenerated electrons with holes. Our approach to these problems was to retard rapid recombination between the photogenerated electrons and holes in TiO2, and we accomplished this by applying high voltage across a layer of TiO2, and it is this feature that distinguishes photoelectrocatalytic system from conventional photocatalytic systems. Our photoelectrocatalytic system is based on the idea that the photogenerated electrons in a layer of TiO2 would move toward a cathode with application of high voltage across the TiO2 coated Aluminum plate. In our system, aluminum plate is used as a substrate for TiO2 and also serves as a cathode. According to our scheme, moving photogenerated electrons toward a cathode would have the same effect as moving these electrons away from the holes, which would have the effect of retarding recombination of photogenerated electrons with holes. Our recent experiments on benzene and toluene showed higher rates of removal with high voltage on compared to high voltage off, which supported our scheme partially. In this study, we have extended the application of the photoelectrocatalytic system to the removal of xylene isomers. With an inclusion of xylene, our list of aromatic compounds includes benzene, toluene, and xylene, in the order of increasing methyl group. Moreover, all three types of xylene isomers were chosen to investigate possible effect of substituent position on the rate of degradation in our photoelectrocatalytic system. Our continuing effort to provide direct evidence to support our scheme has resulted in the measurement of current due to flow of the photogenerated electrons in TiO2 toward aluminum plate. Hereby, we report for the first time to our knowledge a measurement of current from TiO2. The detailed description of our photoelectrocatalytic system was given in our recent publication. The reaction was carried out in a batch type glass vessel at 1 atm and ambient temperature, and the photoelectrocatalytic system along with our scheme is shown in Fig 1. Air flowed through a mass flow controller into the saturator placed in a constant temperature bath at 20°C and 1atm, and was mixed with 90 % air coming from another mass flow controller in order to obtain predetermined concentrations(500ppm, 2,000ppm, 10,000ppm) of aromatic compound in air. This aromatic mixture flowed into and out of a 10l batch reactor initially to allow adsorption to take place in the reactor. Samples of outlet mixture were periodically analyzed with a gas chromatograph(GC, HP6890) equipped with a flame ionization detector and a capillary column(HP 5) to be compared with the target composition. When the target composition was achieved, the inlet and outlet of the reactor were closed, and photoelectrocatalytic degradation of the aromatic compound was carried out in the reactor. During the experiment gas samples were taken at 30 min. interval for GC analysis to monitor variations in the concentration of the aromatic compound. The photocatalyst used in this study was sol type titanium dioxide(YJPC, Korea; 25% TiO2) suspended in alcoholic solvent, which will be referred to as TiO2. TiO2 was mixed with silicon binder solution(silicon, alcohol, water, acid) of pH 3.5 to increase the coherence of titanium dioxide on the substrate, aluminum plate. For the current measurement, aluminum plate coated with TiO2 was used as a cathode while an array of Cu strips in the shape of saw tooth was used as an anode, and a digital multi-meter(HP 344501A) was connected to aluminum plate and the power supply as shown in Fig 1(b). 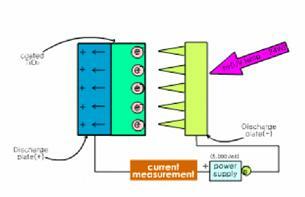 (a) photoelectrocatlytic system and (b) current measurement system. The current measurement was performed with the application of 5,000 volts DC bias in three stages; (1) no UV irradiation for 1 min., (2) UV irradiation for 1 min., and (3) no UV irradiation for 1 min. These stages were repeated many times for signal averaging due to the nature of minute signal level, and aluminum plates with and without TiO2 coating were used in this experiment for comparison purposes. The current measurement data are shown graphically in Fig. 2. Fig. 2(a) was obtained from the experiment with TiO2 coated aluminum plate, whereas Fig. 2(b) was from aluminum plate without TiO2 coating. (a) TiO2 coated Al plate and (b) uncoated Al plate. The current levels in Fig. 2(b) stayed virtually constant over three stages of our experiment, and they correspond to a bias current. On the other hand, a jump of current level at the onset of the second stage and a drop at the onset of the third stage were observed in Fig. 2(a). In addition, the current level in the second stage stayed clearly above a bias current. The lower bias current in Fig 2(a) compared to that in Fig 2(b) can be attributed to higher electrical resistance of TiO2 coated aluminum plate. Thus, both TiO2 coated aluminum plate and UV irradiation were necessary for the increase in current, and this in turn shows that the increase in current is due to the flow of photogenerated electrons from TiO2 toward aluminum plate substrate. where k is the surface rate constant, Kapp is the apparent adsorption coefficient, and Ceq is the reactant equilibrium concentration. (a) o-xylene, (b) m-xylene, and (c) p-xylene. The kinetic parameters k and K were obtained using linear least squares analysis, and the values for k are presented in Table 1. In Table 1, “PEC sys” refers to the photoelectrocatalytic system, “UV/TiO2” refers to the conventional photocatalytic system, and “discharge/TiO2” refers to the system under plasma effect. The removal rates of the aromatic compounds in Table 1 are in the order; benzene < toluene < (o-, p-)xylene, and this order correlates with increasing electron-donating substituent to the benzene ring. Another order common to all three systems is; m-xylene < o-xylene < p-xylene. Between m-xylene and toluene, the removal rate of m-xylene is higher in the photoelectrocatalytic system, but lower both in the photocatalytic system and discharge system. For xylene isomers most pronounced increase in the removal rates occured going to the photoelectrocatalytic system from other systems, and it is in the photoelectrocatalytic system that all three xylene isomers show higher removal rates than toluene. Table 1. Langmuir-Hinshelwood(L-H) parameters(k) obtained in the photocatalytic degradation of aromatic compounds. The higher removal rates for all the aromatic compounds in the photoelectrocatalytic system are attributed to the reduced rate of electron-hole recombination in TiO2, which is supported by our current measurement experiment. The degradation of benzene, toluene, xylene isomers was carried out in the discharge potoelectrocatalytic system consisting of TiO2 thin film, its aluminum substrate as cathode, anode of Cu strips, high voltage power supply and UV lamps. Compared to either the plasma effect only or the photocatalytic effect only, higher degradation rates were observed for benzene, toluene, (o-, m-, p-)xylene in the discharge photoelectrocatalytic system. The higher rates of degradation for these compounds in the photoelectrocatalytic system are attributed to the longer lifetime of holes in TiO2 due to reduced electron-hole recombination, which is supported by the detection of current flow from the photoexcited TiO2 only in the photoelectrocatalytic system. Thus, compared to the systems of either the plasma effect only or the photocatalytic effect only, our photoelectrocatalytic system would be least limited by the number of holes available in TiO2 to the radical reaction. Accordingly, the degradation rates in the order; benzene < toluene < (o-, m-, p-)xylene, in the photoelectrocatalytic system can be correlated with the increasing number of electron-donating substituent to the benzene ring. Furthermore, this suggests that the reaction determining the overall degradation rate favors strong electron donor molecules. Finally, different rates of degradation among three xylene isomers show the effect of substituent position, and the nature of such an effect will be discussed in our future publication. This work was supported by Chung Nam Environmental Technology Development Center. 1. M.R. Hoffmann, S.T. Martin, W. Choi, and D.W. Bahnemann, Chem. Rev., Vol. 95, 69(1995). 2. K. Sunada, Y. Kikuchi, K. Hashimoto, and A. Fujishima, Environ. Sci. Technol., Vol. 32, 726(1998). 3. J.C. Ireland, P. Klostermann, E.W. Rice, and R.M. Clark, Appl. Environ. Microbiol., Vol. 59, 1668(1993). 4. A.L. Dibble and G.B. Raupp, Catal. Lett., Vol. 4, 345(1990). 5. A. Mills, R.H. Davies, and D. Worsley, Chem. Soc. Rev., Vol. 93, 417(1993). 6. H.K. Kim, E.A. Lee, J.H. Lee, C.H. Han, J.W. Ha, and Y.G. Shul, Intern. J. Photoenergy, Vol. 5, No. 1, 3(2003).